She raced to be first to paint the freshly sanded picnic tables. She felt empathy while packing food boxes for low income families. 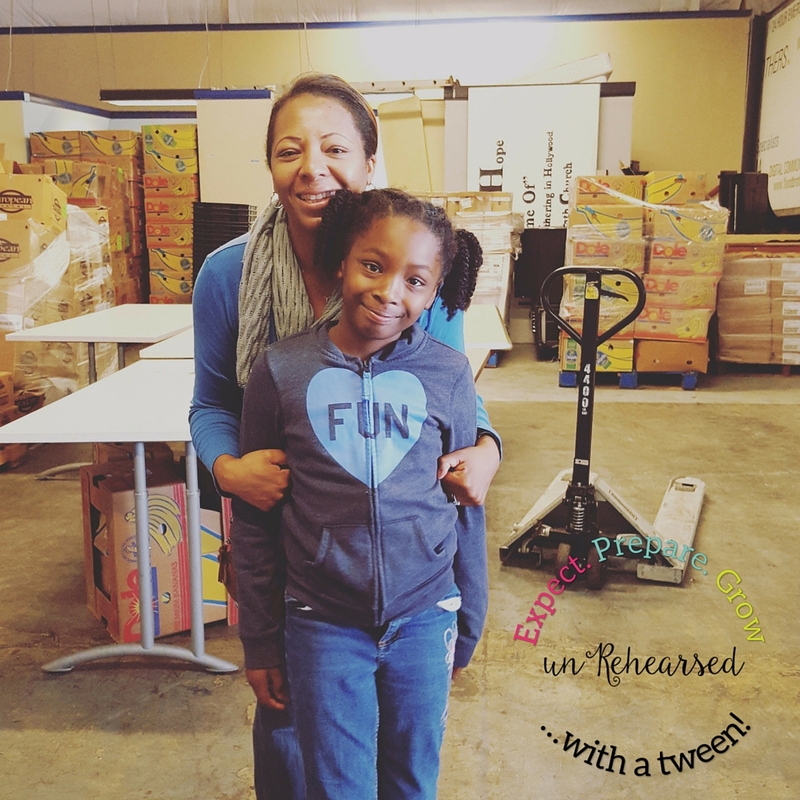 These are a few things Tween Girl has experienced since we started family volunteering. Volunteering was something I first enjoyed as a senior in high school. In the school district where I attended school, one of the graduation requirements was to have a certain number of volunteer hours. I can remember vacuuming the floors of the neighborhood church. My most memorable volunteer moment was feeding the hungry for Thanksgiving. When College Boy was in middle school, he started his volunteer career by helping out at the same after school program he attended as an elementary student. Tween Girl just got her first taste of volunteering about a year ago when we, as a family, delivered meals to senior citizens. After her initial fear of old people, she got very comfortable ringing doorbells and listening to them call her “sweetie”. Since College Boy went off to school, she and I started doing monthly volunteer projects. We helped set up a neighborhood recreational center by sanding and painting picnic tables and yard work. Our latest project was packing food boxes right before Christmas at the Fountain of Hope. Tween Girl saw, first hand, that not all kids have the pleasure of strolling into the kitchen to get a different snack every day. This project made a mark and had her wondering on the ride home why and how people don’t have enough food to eat. I explained to her that people get into many different situations for many different reasons. I believe that when we are blessed we are charged to “be a blessing to others” (Genesis 12:2). Our way of passing on that blessing can be shaped in many different ways, one way is by volunteering. Now, we volunteer once a month at the Fountain of Hope, her idea. Just the reaction I wanted. I remember College Boy telling me how some of his college friends from Georgia had never traveled to the state’s capital Atlanta. What?!? Seriously? Kids benefit from traveling outside of the area they live in because it shows them that they don’t live in a bubble. So many kids, like College Boy’s friends, believe that every other kid lives in the same conditions as they do. Some of our projects have been in low income areas, where children don’t have enough to eat or their parents don’t have jobs. This exposure opened both of my kids’ eyes, causing them to accept the responsibility to help others. Go ahead, admit it. The tween years can be a vain, self centered stage. There are only so many selfies a person can take! Volunteering takes the focus off of the tween and allows them to focus on others, even if just for a few hours. It’s never too early for children to learn how to communicate not just with their peers, but with adults as well. Many kids are intimidated or shy when it comes to interacting with adults. Volunteering can build a child’s confidence level, allowing them to feel comfortable around adults. I believe they become comfortable because they are working, shoulder to shoulder, with grown ups. They see adults performing the same volunteer tasks as they are, which puts them on the same level. This atmosphere can create some memorable and teachable moments between a parent and their child. As a kid, I remember having trouble starting a task, only to stop working on it mid way. Unfortunately, I passed this trait along to my kids. The good news is, though, that I learned how to start something and see it to completion and both kids have been able to see that and emulate it. During my second time as a single parent a few years ago, one of my goals was to reinvent myself, which included me completing tasks and goals. How great this would have been if I had learned this as a child? Volunteering has shown Tween Girl the value of being on time, realizing that others are relying on her to be there to help. She also learned how to work with others. Yes, she works with her classmates at school during the week. Volunteering, though, puts her in a different setting with a mixture of adults and children working together for different reasons, other than what she and her classmates work towards at school. Ok, so I know I just said that tweens can be vain and self centered. Hear me out! As parents, we are our kid’s first role model. That is two fold because not everything we do, as parents, should be modeled. Kids are like sponges, they soak up everything, the good with the bad. Notice how, when in front of others, they spout off about how you drank two glasses of wine in one night? This would have been the perfect opportunity to mention the great time that was had volunteering last week. I’m just sayin’…. The powerful characteristics Tween Girl has displayed have the potential to grow just as she grows. Let’s be clear. I am not saying that volunteering with your tween will create a life long thirst for servant hood. I am saying that by volunteering with your tween will set an example. And as you know, we all learn from examples. Before you go out on your first project, read over PBS Kids’ Family Guide to Volunteering. This guide is particularly for families volunteering with kids under 16 . If you are in the Atlanta area, Hands on Atlanta offers Family Service Saturdays. Projects range from different needs, such as hunger and homelessness. Not in the Atlanta area, try Volunteer Match, where you can search for volunteer opportunities based on you issues you care about. Have you ever participated in a volunteer project? Would you ever consider volunteering as a family?